People of the Miao ethnic group yesterday started to celebrate the Chixin Festival, or Eating New Rice Festival, in southwest China's Guizhou Province. During the festival, Miao people will offer sacrifice to their ancestors, taste new grain, dance with folk songs and play bull fighting games. "Chixin" means eating the new rice. The rice is newly harvested; wine is brewed from new glutinous rice, and locals eat fresh vegetables, fish and meat. The Chixin Festival is the festival that celebrates the new harvest and the festival is celebrated across all areas where Miao people live. The most thrilling event during the festival is the bull fighting. 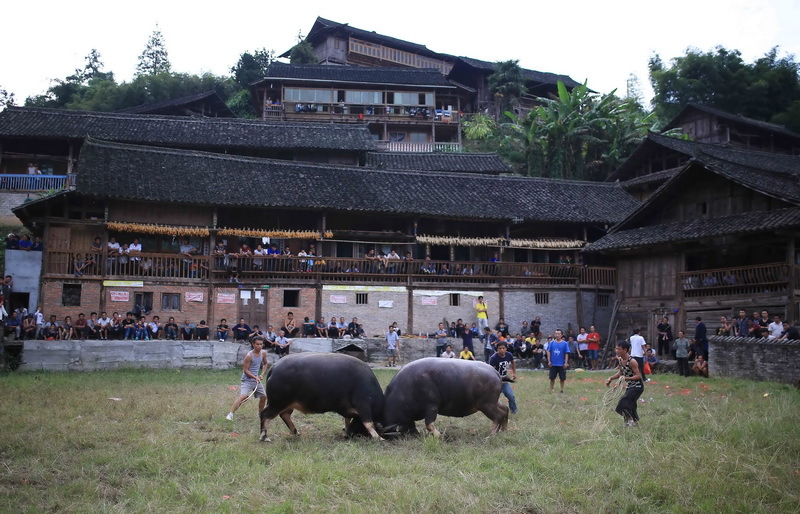 As an ancient ethnic group long devoted to agriculture, the Miao people worship the buffalo. The arena of bull fighting is often set up in a harvested paddy field, where the nearby terraced fields served as natural bleachers. Before the fighting, performers wearing their most luxurious dress will play Lusheng (a musical instrument made from bamboo) and set off firecrackers to get the festive atmosphere going.